Before arriving, we knew next to nothing about Bratislava and had only decided to stop there to kill a few days before meeting a friend in Vienna during our trip around Europe. 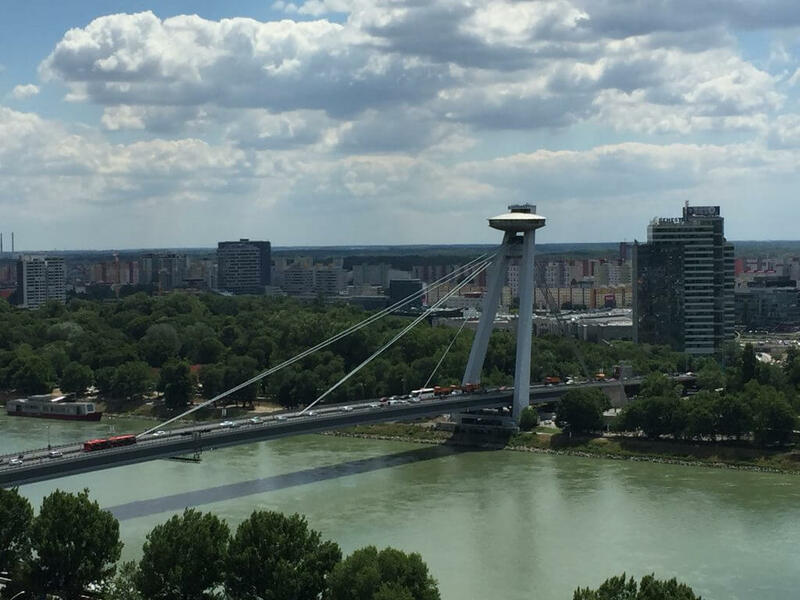 Bratislava turned out to be a brilliant hidden gem that was once less accessible because of the Soviet Union’s Iron Curtain. 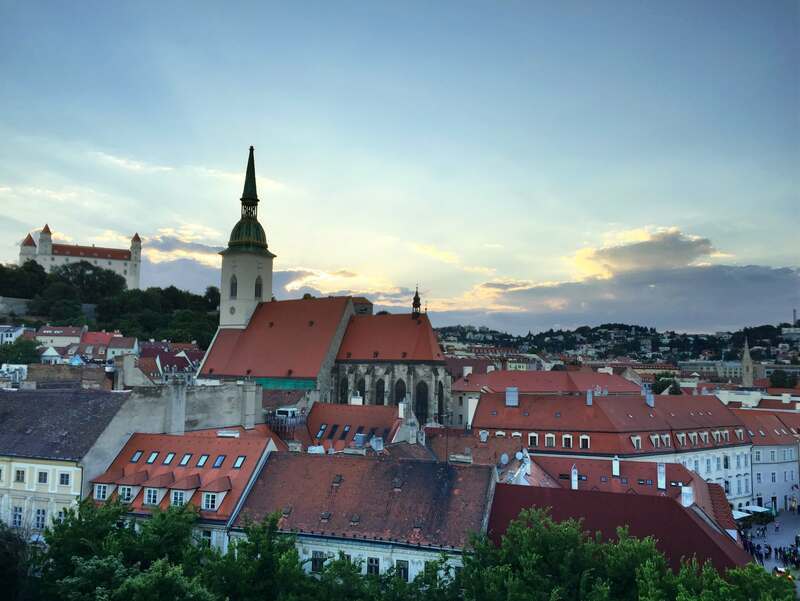 Due to its unexpected beauty, delicious Slovak cuisine, and incredibly hospitable people, we knew we had to write about traveling to Bratislava so others would know Don’t Skip Bratislava while traveling in Europe. As our Flixbus from Budapest arrived at the bus station, we were both a little disappointed, although neither of us admitted it at the time. The city looked extremely industrial, unwelcoming, run-down, and very post-Soviet compared to Budapest. Even as we walked to our Airbnb, our opinions didn’t change. 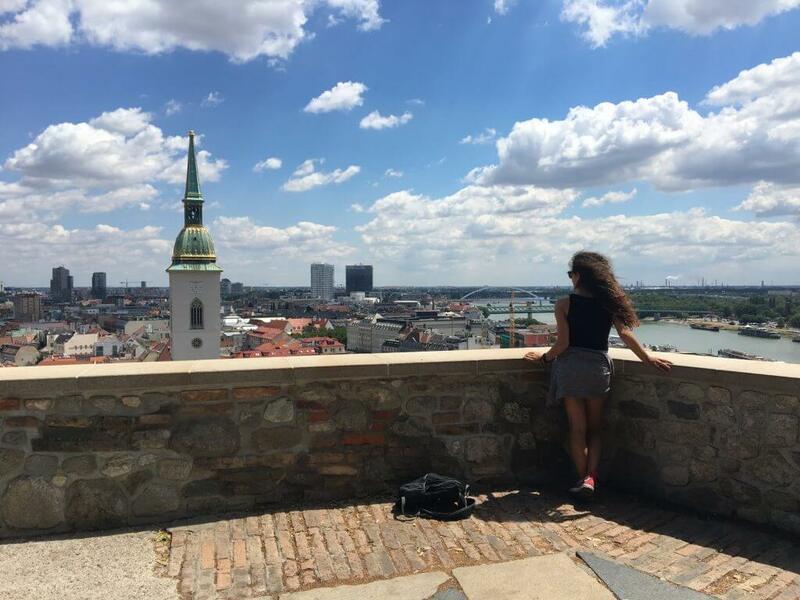 However, once we put our stuff down and started exploring the city, particularly the Old Town, we fell in love with Bratislava and both now consider it one of the most surprising places we’ve ever visited. 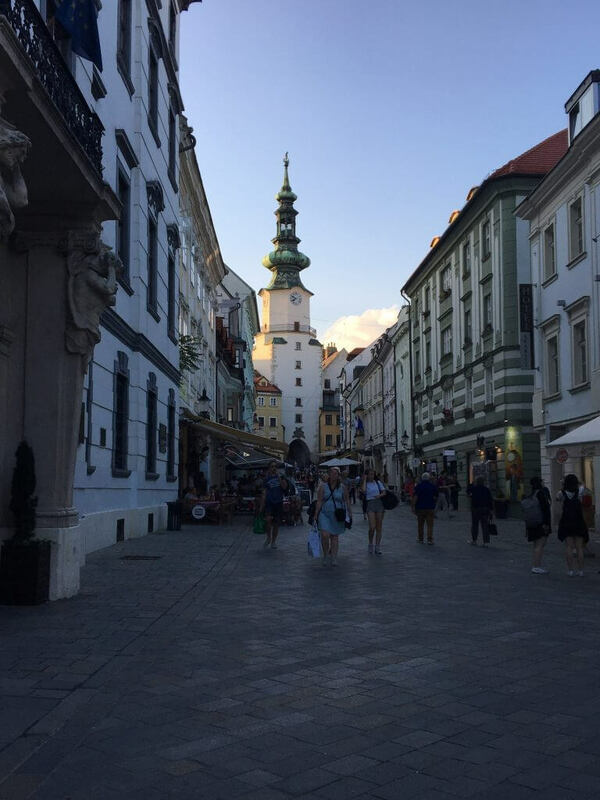 Bratislava is fairly small, walkable, and easy to navigate. Therefore, when looking for where to stay in Bratislava, you really can’t pick a bad location, unless it’s super far from the center. We stayed at an Airbnb near the Church of St. Elisabeth, aka the Blue Church. Our room was private with a shared bathroom and two other rooms that were rented out. It was a few blocks west of the center just between Old Town and the bus station. The location was great. 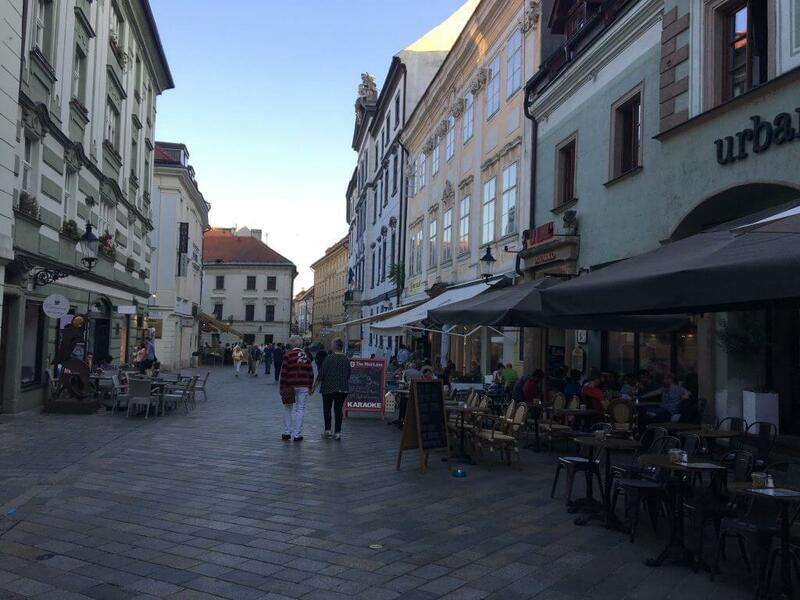 Everything in Bratislava was super walkable. It was also really cheap, as are most Airbnbs in Bratislava. When we got to Bratislava, not only did we have low expectations, but we also hadn’t really researched much. 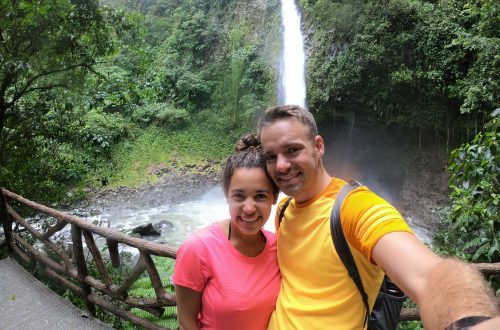 Luckily, our Airbnb host gave us a map and some ideas of things to do – one of the many benefits of using Airbnb! 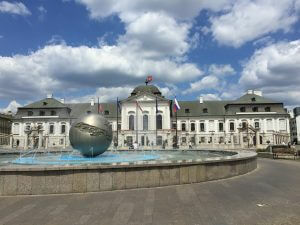 We only had about a day and a half in Bratislava, but felt as though it was enough time to see everything in the city. 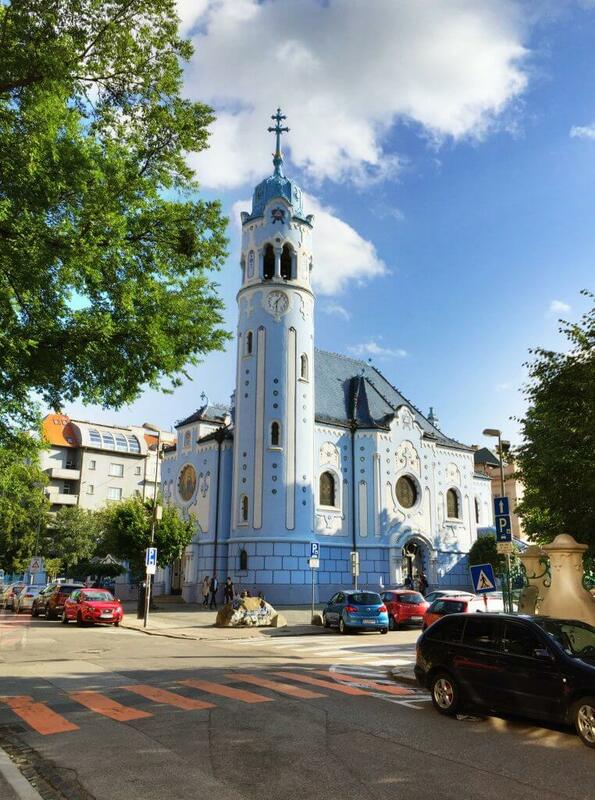 Blue Church of St. Elisabeth – Since our Airbnb was located right by it, we ended up seeing it on our way into Bratislava’s Old Town. It was pretty cool to see from the outside and totally different from most other churches. We peeked inside to see it, but there was a service going on. Sculptures – There are numerous statues scattered throughout the Old Town. We didn’t see them all, but we came across a couple of them. St. Michael’s Gate – It’s the last of the city gates that originally protected the old city of Bratislava. Plus, it’s a pretty cool way to enter the city because you cross a bridge that crosses the moat that used to surround the fortress of Bratislava. Slavín (Slovak War Memorial) – While this was quite a hike from the old town, it was certainly an interesting site to see. It took about 30 minutes to get to because you have to go uphill for most of it, and there are some curvy streets that lead up to the Slovak War Memorial. It’s easy to get lost, as we did. UFO Bridge – The Most Slovenského národného povstania, or MOST SNP, is a famous Soviet era bridge in Bratislava. However, it’s more commonly known as the UFO Bridge or UFO Tower because of it’s unique shape. The bridge starts at the edge of the Old Town and crosses the Danube river. There’s a restaurant in the UFO itself and an observation deck on top of it. The elevator ride to the top is 6.50€. We did it and thought it was worth it because of the great views of Bratislava. Bratislava Castle – The Bratislava Castle sits above the rest of Bratislava looking down upon it. 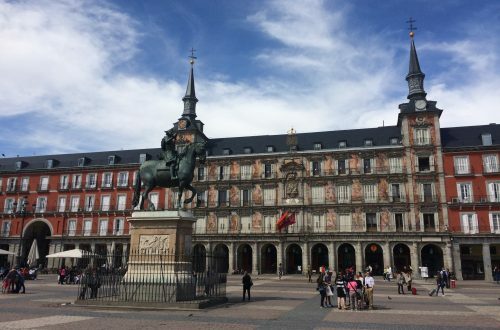 It’s pretty, but not as beautiful as other European castles. We hiked up the hill to see it. However, we didn’t pay to take the tour. It might have been neat, but we didn’t feel like we missed much by skipping it. The entrance fee is 7€ if you’re interested. Grassalkovich Palace – This is where the President of Bratislava lives. 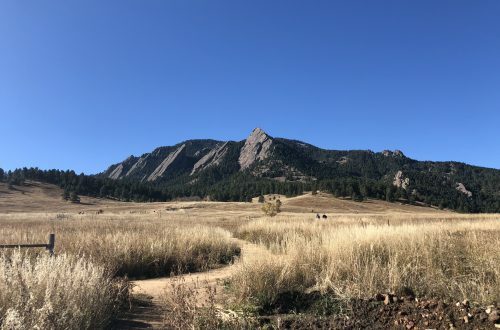 It’s just a few minutes walk out of the Old Town. The fountain in the front of it is a great photo op. Supposedly it’s open to the public once a year too! Grand Cru Wine Gallery – If there’s only one place to drink at in Bratislava, it would be the Grand Cru Wine Gallery. It’s hidden away on the corner of a small street in Old Town Bratislava, so you might pass it if you’re just walking the main drags. We just happened to find this place while searching for places to go in Bratislava and knew we had to write about it after visiting. The place is owned by a Slovak family. Their son was hosting the night we showed up, and he poured us a ton of different Slovak wines. He helped us pick out some reds and whites that suited our tastes and followed it up with seemingly endless glasses of different wines. It was pretty inexpensive, but we tipped well because the service was outstanding. They spoke English too, so no need to suddenly learn Slovak! Slovak Pub – We ate here on our first night in town because of a recommendation from a friend. Just like the city itself, we had low expectations of Slovak food. After our first bite, we were totally blown away! We cannot recommend Slovak food enough! In fact, it was some of the best food we ate throughout our entire trip. We recommend getting the Slovenska misa pre 2 osoby (Slovak platter for 2 persons). It includes dumplings and pirogi’s and is very delicious. Lemontree & Sky Bar Restaurant – Well, we actually just drank here, but wow was it an amazing view! Lemontree & Sky Bar Restaurant’s view offers the best view of any bar or restaurant in Bratislava . It’s a rooftop bar and restaurant, and while it doesn’t have a huge outdoor area at all, the view is pretty cool. The cocktails were pretty good too, even though they were pricier…for Bratislava. 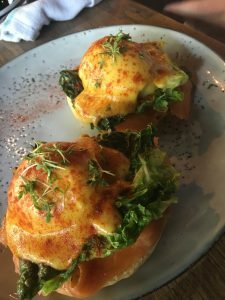 Urban House – This hip little cafe and restaurant served a delicious breakfast. We had the eggs benedict with lox and yogurt parfait with granola. It was pretty tasty for a relatively cheap breakfast. Their coffee was also good! Green Buddha – If you’re craving some Thai food, we highly recommend this place! Yes, it was a slightly intoxicated dinner stop after we tried our fair share of delicious Slovak wines at the Grand Cru Gallery with their amazing host. However, we believe the Thai food would have tasted just as good if we were totally sober. Definitely get the pad thai! Bratislava turned out to be one of our favorite cities even though it was just meant as a pitstop. 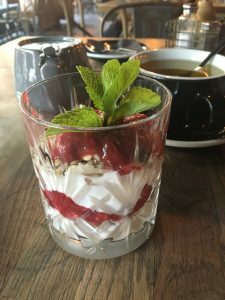 Visiting Bratislava is very budget friendly as it’s pretty cheap compared to surrounding cities, and the Slovak food was absolutely wonderful—certainly an unexpected surprise! Have you visited Bratislava? Do you have any other recommendations for Bratislava? What a great post! I am visiting Slovakia in February, and was going to go to Kosice instead of Bratislava even though it’s out of the way. Maybe I’ll change my plans around, Old Town sounds awesome. Thanks for sharing! Thanks Jade!! 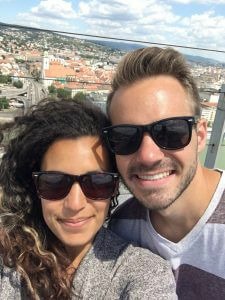 We ended up loving Bratislava so much and are happy we stayed there. We have never been to Kosice so we can’t recommend one over the other but have nothing but good things to say about Bratislava. Let us know if you have any questions!